Hi! I’m Linden, Creative Director of Vine Lines Creative. I live in Canberra with my two small children and husband. I make quilts, I design quilts, I test quilt patterns and I work and teach at my LQS. My patterns are a mix of symmetry, pointy points and a dash of modern quilting. 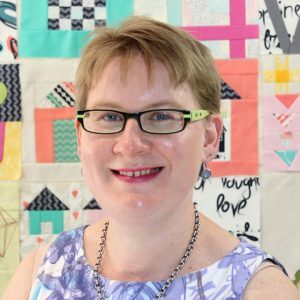 I belong to Canberra Quilters and Canberra Modern Quilt Guild; I love the freedom that modern quilting gives me. I piece and quilt on a Janome6600P, using Aurifil Thread. I use a Westalee Free Motion Ruler Foot along with their ruler templates. Vine Lines’ Pattern Testing Agency takes the pain out of the pattern testing process by coordinating our group of pattern testers, and providing a detailed report with suggested edits, freeing you up to concentrate of designing more patterns rather than spending your time with boring admin tasks. I hold degrees in music performance and drama production. Opera and musical theatre make my heart glad, along with running a business that allows me to work around and with my family’s needs. I also work in the office of Stromlo Christian Church which is where we attend. I couldn’t function without my daily doses of caffeine and I do like the occasional piece of dark chocolate-coated ginger. Club mint dark chocolate is also acceptable. White and chocolate do not belong in the same sentence. I am an introvert which is one of the reasons I love social media; I can switch off when I need to. I love my tribe and couldn’t function without them either; they keep me sane. Welcome to my world; happy quilting!